I was delighted to see images on my twitter feed of Gloria Steinem posing beside the Repeal Projects jumpers and the AimsIreland T shirts. 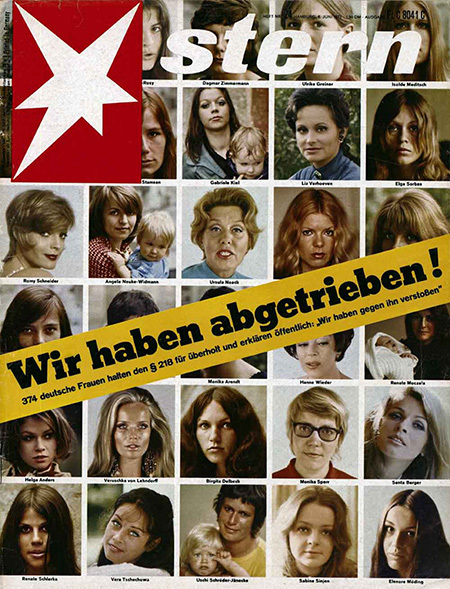 This action followed on from the French & German Actions of June that year: the French magazine Le Nouvel Observateur Published the Manefestio which was orchestrated by Simone de Beauvoir and was sign by 343 women and the Stern Magazine cover is wonderful and 70 women came out about having had an abortion. But I was just one person back in 2013 but soon other women started stepping forward, and when I was asked to take part in the X-ile Project it was something I could not refuse. Women in Ireland have started to come forward to ‘come out’ (as Panti Bliss recently put it) about their abortions, we have done so follow the footsteps of many other brave women, and Gloria Steniem is one of those women. She has shared her story about having to get an illegal abortion. So I will be keeping an eye out for Gloria Stenism on the Women’s Podcast, I am looking forward to what she has to say about #repealthe8th, I don’t doubt she agrees that we need Free Safe Legal and local abortion services in Ireland.